So... you wanna be a designer? I'm taking a moment to share some things I think may be helpful. If you agree, or are encouraged by this, please comment on this post. Actually, comment if you disagree, or are feeling discouraged, too! Some of you already know that in addition to blogging on this site, I am the owner of the Find a Dressmaker website. There are Facebook pages for both this blog and that site, to which you are all enthusiastically invited. Your participation is welcome, and I am really jazzed by all of the questions and comments I currently receive on a daily basis. If you love this page, and you generally sit down at your tablet, laptop, or desktop computer to read it, feel free to subscribe (look to your right on this page). If you use your phone to read it, I am totally impressed by your eyesight. If you use a Kindle, and don't mind a small service fee, go ahead and subscribe via Amazon. I also have Twitter accounts for both groups. The link is to the right on this page, and there's a link to the Twitter handle on the Facebook "I Love My Dressmaker" page, for the other. Your natural next question is probably, "Why do you do all of this?" Well, I am a member of a small tribe of garment industry fanatics who simply adore the process of sourcing, making, teaching, learning and interacting. Because I am also a dressmaker and natural promoter of related things, I do earn some of my income this way, too. None of the businesses listed on this site pay to be mentioned here, nor will I accept it if offered. That's how I keep the reviews here true and useful. I may be friendly with some of the owners, following years of interaction, but none are my personal friends. Sometimes I may say some things in the name of constructive criticism, but I never aim to be mean, unfair, or hurt anyone's businesses. For creative native New Yorkers like me, the garment district really does feel like the heartbeat of the city. If this describes you, too, you know exactly what I mean, and I welcome you to the family. It's already in your blood. Those of us who have haunted the district since childhood, understand and embrace all aspects of this wonderfully creative, boot-strappy environment in a way many others just don't understand. And that's okay. We're a bit weird, and we know it. Running the blog, the Facebook pages, and the website, I get lots and LOTS of questions. Among the most common are from aspiring designers, who just aren't quite sure how to get started. By this, I mean people who have creative ideas, want to make, or want to have things produced for sale, but have never actually made any business moves in that direction before. Having no idea where to begin can be overwhelming, confusing, and expensive. Even some of the best books on the subject can also be overwhelming, if you are still learning the basic vocabulary to get started. So, this post is aimed at helping you. Be advised that any specific consultation that is unique to you and your goals, and really worth the time, experience, knowledge, and effort being expended on your behalf, comes with a fee. You'll have more questions beyond those answered here, of course. So many questions. There are businesses who welcome your questions, and will guide and advise you through the process, should you choose to pursue your plan. Many of them charge a fee, while some consider it a value-added service, and will offer you a helping hand, in the interest of doing profitable business with you afterward. Now, I think we would all agree that the creative/dreaming/thinking part of the process is the fun part. A simple sketch is an idea, not a design. When it becomes a 3-D functional object, THEN it's a design. If you know how to drape, design, and sew, you can take yourself that far. And no, you haven't designed it, of you used a commercial pattern (Burda, Butterick, Vogue, etc.) to create it. But you can always use a commercial pattern as a springboard for an original design of your own. I regularly update a group of sewing related books I recommend, available through Amazon.com. Click here to see them! If you want to start a business, whether in fashion or any other area, the first steps are generally pretty straightforward. You can't make things without money to buy the materials, equipment, and hands to make them. You have to know what your product is, and who your customer is. That imagined customer needs to actually exist. If you don't have the money to get started making a prototype, there are only a few ways to get it. If you lack a generous back account or great and ample credit of your own, or willing friends, family, spouses or others to finance your efforts, you have a difficult road ahead, and you'll have to be very creative and resourceful to find another way. To better understand the financial end of things, assuming you plan to grow, read this. As cool as it sounds, the idea of simply making a lot of stuff and selling it, is a bad idea, unless you are just incredibly smart about what to make, and who will want it, AND is certain to pay you well for it. Fashion Institute of Technology sponsors a "City Source" event, where various garment industry services and providers offer their wares and talk shop with anyone who has questions. I have attended two of them so far this year, and if you come with an open mind and ears, you are sure to learn A LOT! The FIT website generally advertises the event in advance. The Fashion Center Kiosk, whether online or in person. A recent post on this mysterious booth will give you more information. There are many things you need to do to get a pattern made for production. Because there is so much to know, you've got to trust a professional to get you there. A patternmaker with industry experience, Cherie Bixler can walk you through, make a pattern, and consult with you (for a fee) on the specifics of your plan. Create a Marker is a company whose services you don't even know you need yet. They make a practice of treating everyone who comes to them as if they are "the next big thing", and I just love their attitude. When it comes to grading, marking, spec sheets, file formats and so on, they know what you need to know, and will happily educate you as you move along. I met one of the owners at the City Source Expo at FIT, and felt an instant affection for this company. The GIDC (Garment Industry Development Corporation), which is a link between fashion designers and manufacturers, helping designers make the connections they need to survive and thrive in New York City, specifically. Don't cut corners. Your samples need to be perfect by meeting the same standards you need your production to meet. You don't want approximate samples. Invest in a professional, and don't let any non-industry person "try" to do it for you. Believe me. I say this as a dressmaker who has "tried"... Go to the kiosk for help finding samplemakers. There are so many variables governing who and where you will want to make your items. Lots to consider, specific to your needs. Look to the GIDC for help in that area. Read this blog. You're already here. I've got you covered. When you need significant quantities, many of the places mentioned here can help you. Negotiate discounts basde on the yardage you are buying. Designers go to these stores, too! Work for someone else first. You may not want to, but you actually need to. That is how you shorten the learning curve. If you create beautiful garments with your own hands now, and your skills are mainly what you can do at the machine, consider your hands golden. If you are in New York City, your hands are needed by designers like you wouldn't even believe. You can work for a designer, and turn out beautiful things, if you have the skill set to do it consistently. No, you won't earn a fortune, but you will have steady work, while taking no financial risk, so that's one way to go... Think on that a bit, okay? While you're at it, read the articles in this series about starting a fashion business. As of 10AM NYC time today (7/28), the empty spot has been taken (thank you! ), but I'll allow one more if you want to commit today, after which, I'll consider the trip completely full! And yes, the trip is now COMPLETELY full! But, there will be another one! I'm doing a one-day only, "best-kept-secret" garment district shopping trip on Friday, September 28. Friday is the chosen day of the week because all garment district businesses will be open. You can still even catch a Broadway show or museum exhibit while you're here! Space is limited. Too big of a crowd is no fun. Registration requires advance payment. The cost of this guided tour is $75 per person. If you use this trip to shop and participate in what NYC has to offer, you will save at least as much as you are paying, and probably far more. Wanna come? Click below, and the details on meeting time/place provided. From outta town? If you need hotel and/or travel help, I will advise some of the BEST NYC secrets I know! Also, you can click on hotels above (this page - to your right) for the most standard and convenient choices. Payment is only accepted via PayPal (you do not need a Paypal account), credit or debit card. No cash, personal checks, or additional payments will be accepted on the day of the tour. The trip will involve a good amount of walking, so come prepared, and healthy. If you walk in wearing a t-shirt and shorts, you might feel underdressed. This place is very much a bustling New York City office, with tidy professional "Account Executives" ready to help you. When you enter, a cheery receptionist greets you, and asks you to state your business. A beautiful showroom, with walls lined with gorgeous novelty fabrics, and an efficient layout of swatches and colors showing their VAST range awaits. While a photo-worthy environment, I'm a terrible photographer, and probably couldn't get a good picture in there to convey its fabulousness. They have no minimums, the selection of fabrics is beautiful, and the prices are wonderfully reasonable compared to the street-level retail stores. How would I have ever known this place ever existed, if my own friend hadn't mentioned that this is the best place to get silk solids? I really don't know. It seems no web search reveals them. Their website is a real yawner, and doesn't convey the level of quality that is so blatantly apparent when you go directly to the showroom. And, oh, they have so much more to offer than silk solids! See the sample index on the web. They give you a full price list. An honest, clear, straightforward price list. This is eye-to-eye, hand-to-hand business, where they don't care if you are Chanel or Sally Ann - you'll be treated well. They speak to you as if you matter. And your business matters. They also sell high-end novelty fabrics, suitable for one-of-a-kind, very special creations. The prices of those goods reflect their quality and uniqueness, but if you need it, you will find it there. Oh, and 81 colors on their color card, okay? Not for everything, of course... but man, 81 colors????!!! C'mon! Now, this isn't really a retail experience like you would get at street level, and it can be intimidating and pressure-filled for people who aren't used to having to clearly articulate their purpose when they enter. But if you already know what you need, this is a great way to get your fabric online or in person. And they seem to be wildly efficient. My friend who gave me the tip is fiercely loyal to this place! Update: There will be a second one in November! Update: As of 8:06 AM New York time today (7/24), the tour is full. I will likely do another in the future. The payment link has been removed. 242 W 36th St. 7th Fl. 90 years. That's a long time. I'm a sucker for a family business. I also love tools, and long, technical explanations about how they would go about creating your piece. You bring the fabric, and then you look at their walls, website, or something else you've seen to give them an idea of what you want. They tell you if it is possible, talk about the process, and quote you a price. Then, you decide. How about a bridal bouquet you can keep? Forever? How about a large rosette to be used on a curtain tieback or pillow for home dec use? How about a beautiful floral embellishment for your garment, your keepsake wedding journal, your hat, your hair, your... well, anything, really? Be sure to visit their website for ideas you didn't even know were possible. Going to their office is a truly delightful experience. Beautiful and comfortable to wander around in, you are encouraged to make yourself at home. You are greeted with enthusiasm, courtesy and respect, by people so passionate about what they do, you'll eventually have to tear yourself away. Today I spoke with Warren (one of the owners), but the personality of the business is extremely customer-friendly. I overheard customer conversations during the time I spent there, and am confident that the same level of kind guidance is offered to everyone who approaches them with an idea. And boy, do they have examples to show off just how great the work is! Floral topiaries, leaves, flowers ideal for window decorations, and LEATHER.... ahhhh... LEATHER! Wanna know more? Read this Wall Street Journal article. And sculptural custom flowers are just the thing to take your project to the next level. You don't need to go there to do business. You can call or email, instead! This is not a negative review... just a true one. Bear with me; BOTH the store and potential customers will get what they need to know out of this post! 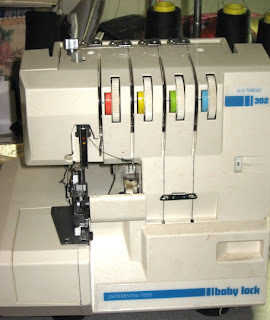 My sweet little flawless monster of a Babylock serger has been acting up. It will still make a beautiful chain of stitches, but will not advance the fabric as it stitches, leaving only a tightly tangled glob of fabric in the feed dog area. I can't tell at all what is wrong. It was suggested that I oil it, which I just about NEVER think about doing. Did that, and no improvement. I knew it was time to seek a professional. So, the store where I bought it some 20 years ago still exists in the garment district, and I figured I would inquire about service when I was in the neighborhood the next time. I stopped in to this quiet little store with no other walk-in customers, strode in with an energetic hello, and had just begun to explain that I had bought a Baby Lock machine from them about 20 years ago, when I was abruptly interrupted at the name "Baby Lock". "We only sell Juki and Singer here," The salesman, annoyed that I even began what threatened to become a conversation abruptly shut me out of conversation entirely, turned away, and bid me a good day. Yikes. Okay, so no offer to sell me a new one, although I could see the walls were lined with quality Singer and Juki machines. No attempt at a sale, a conversation, no suggestion for anywhere else to go (although it was quite clear where he might have suggested I go...). I got it. As I'm leaving, another employee enters, and I considered the possibility that this might be the employee with more charm than the first. I look around just a bit at the machines on the walls, and the new guy says "May I help you?" "Just looking", I responded, because it was true. "Can I help you?" The first angry man shouts from the back of the store, practically simultaneously. "Nope just looking. I'm still the same person." I responded. There was an audible huff, and he went back to whatever he was doing. So here's the deal. If you're in the market for a Juki, Singer, Brother, or another brand they represent, or pressing or cutting room equipment, whether for home or industrial use, you can buy one in this store. They are known for great, fair prices, and have been in business for over 60 years. If you already know what you need, and don't need any help, you will be able to complete a transaction there, and they do have quality machines. No small talk, just an exchange of money for machinery. And sometimes, that's all you need. I have to admit, that despite my less-than-friendly experience, this is still where I'd likely go if I wanted to buy any of the machines or equipment they sell. A while back, I saw a Downy commercial featuring Amy Sedaris in an amazingly cute dress (below). This dress is a springboard for an idea that I would love to do in polka dots. Actually, her dress looks a lot like this one from Talbots, but more ALIVE, in my opinion, and right for her shape specifically. I've long been intrigued by what polka dots, stripes, and patterns do when pleated, and the way the pleats just make fabrics dance with the wearer's movement. I can see so many projects in my head, but never knew how to execute them. Naively, I thought that one could simply buy pleated fabric and manipulate it to work with a pattern, OR give a length of fabric to a pleating company, and then cut it into the desired pieces and construct a garment. But... waitaminnit... I hadn't actually thought it through. Had I really thought about it, it would have been obvious that more thought has to go into these things. If you have a length of fabric pleated, your cutting is limited to straight lines, unless you interrupt the pleats by sewing them into seams. Awkward. Messy. Will end up an eternally unfinished project or unrealized artistic vision. And this, my friends, is why you need to know about International Pleating. And to fully understand how enlightening my visit at this company was, you need to meet George Kalajian. I will do my best to introduce him to you here, so that you can live my experience vicariously through this post, and understand why this company is SO amazing. A few days ago, I was warmly welcomed into this vast, creative, factory-like space on a brutally hot New York City afternoon. When I arrived on the fourth floor, I entered a hallway of several workrooms. It was unclear which one was a pleating company, but I entered the friendliest-looking space, and verified that it was the right one. This patient, intelligent man, who was obviously passionate about his craft, talked with me for the next half-hour or so, explained some important aspects of pleating, his role in the garment industry, and his family history in the pleating business. He showed me a gallery of beautiful pleated garments they had done, and I was just blown away. Oh, the possibilities! For starters, pleating isn't neatly folding and then just permanently creasing lengths of fabric for you to use in your sewing project. Pleating is engineering. They need to know how you will use your fabric, in order to pleat it properly for your use. Where will your seams be? How does it need to hang? This is mathematical, scientific, artistic... specific! How do I know that they know what they're doing? They are in this business for FOUR generations now. This family has been in the pleating business since 1931. With a family history that travels from Armenia, to Lebanon, to New York City, they have long been immersed in the business of making things. George's quiet father, who sat nearby while George talked to me, began learning this business when he was a boy of only 8 or 9 years old. And it is a complicated affair. Some of the pleating George showed me requires 14 processes to get the right look and feel. How do they do it? The methods are closely-held family secrets. Gotta love that. They know the whole business, soup to nuts. George has been a manufacturer of garments when the NYC Garment District was a real manufacturing center, he's been involved in contracting, and he's seen the rise and relative demise of the garment district and has shifted to accommodate its changing face. This is a story of artisans, experts, survivors... and thrivers, frankly, in a time when many businesses have just succumbed to the ever-shrinking opportunities in the garment industry. So, the next obvious question is, "How much does it cost to have your fabric pleated?" The answer is, "It depends on what you need done... but you can afford it." It is surprisingly affordable, considering what they do. Get this... everyone needs help to get their fabric pleated. You need to consult with them first, so they know how to pleat your fabric for your project. How much extra do you pay for this? Not a penny. It is a value-added service, because you can't do without it! It is VITAL to the process. How cool is that? "Will they pleat my fabric if I am only doing one or a few small projects?" The answer is "Yes!" Do I need to be a manufacturer? "No!" Finally, "How much fabric do I need to buy?" If you are making a skirt (more common than most projects) use the bias skirt pleating calculator on George's blog after consulting, and you will know! There is a lot to know, and a lot to understand, but if you as fascinated as I am, you will be inspired. After engaging him in conversation, I was amazed to learn technical facts I never knew anyone had already sorted out, like that there is a 48 pleat industry standard for a pleated skirt. I mentioned that I would love to make a maxi-style dress using an ombre fabric, and he said that ombre makes an arc when pleated. Just think for a minute, and you'll see it. Of course! Unless you cut rectangles, and happen to be shaped like a rectangle, how could you form anything but an arc? You will also need how to properly cut and stitch your pleats. It is likely that you don't already know. If you think it is worth taking a try-and-see approach, consult the International Pleating blog for why this approach is ill-advised. So, if you want to manufacture pleated garments, just know that when you go out looking for service providers, that there are regular patternmakers, and there are pleating patternmakers. There are pleaters who serve the garment industry, and there are those who make pleating patterns (for the actual pleats, not the garment). Getting your fabric pleated up uses the combined expertise of all of these functions. This is an engineering project. And... you just HAVE to see the International Pleating blog! Go after reading this, seriously. And continue to keep your eyes on the blog for future posts, where George will soon be explaining/defining "couture pleating", to help educate us all. What a wealth of information and history this company/family has. And there you have it, folks - another reason to "go upstairs" in the garment district. Call ahead for appointments (you'll need one to discuss your project), but they operate during standard business hours. So... I walked into the Museum at FIT, not knowing what this exhibit with such an uninspiring title would be, and wearing my truly skeptically negative, New York City attitude. Nose scrunched, upper lip curled, I thought, "What a lazy idea. Yeah, I get it. I think I'll pass. "A" for Adrian, "B" for Balmain... whatever... yawn." Yes, there was a part one. Yeah, I missed it. But with some time to kill, I entered the display space. I am very happy to report that I was wrong. FIT hit it out of the park. Again. Not only that, but beautifully contradicting some of the points I addressed in my "Quality" post, I saw that some of the featured designs were even made of materials such as "synthetic sheer" and "poly"! And the quality of these designs still shone through. I stand corrected by these masters. A magical Charles James dress (Be sure to click through for that link; there couldn't possibly be a better photograph to show how lifelike this creation is...) , circa 1955. Beautifully sculpted, looks like it could take a breath on its own. No figure supports it in this exhibit. The dress is pure sculpture, in smooth, beautiful pink(ish) silk. The work of the costume designer Irene, whose name I did not know, but whose magic I have since discovered! 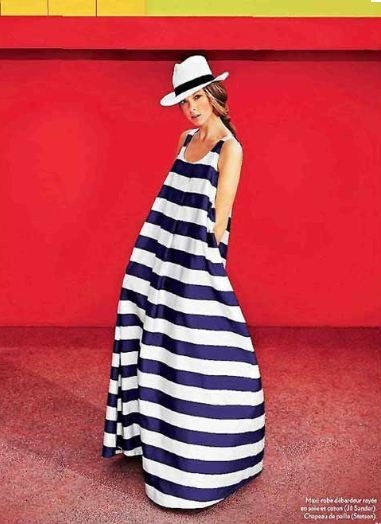 A striped dress by Jill Sander, so simple, clean, and timeless. Sorta exaggerates the horror you feel at imagining what wide, horizontal stripes could do to your body, but pretty for the right person! And the wonderful, brain-bending designs of Comme des Garcons, which have always thrilled me. You've got until November 10, 2012 to see it.